Matt’s March Madness isn’t over yet! 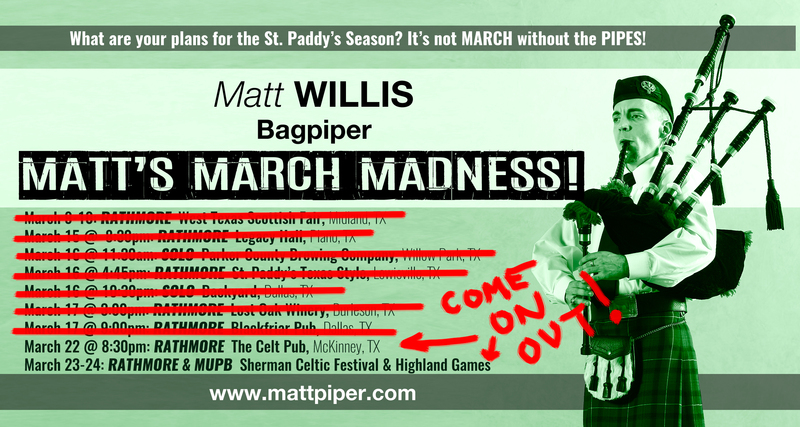 Come out this Friday 3/22 to see me with Rathmore in McKinney at The Celt Irish Pub, and then head a bit further north to Sherman to the 3rd annual Sherman Celtic Festival & Highland Games on 3/23! Rathmore on at 10:00AM (not a misprint!) show and then with Metroplex United Pipe Band for opening ceremonies at noon! In the meantime, I’ve now played the first 18 tunes from Scot Guard Volume 1, with today’s entry being a great one titled “Hot Punch” though your guess is as good as mine as to where the name comes from!